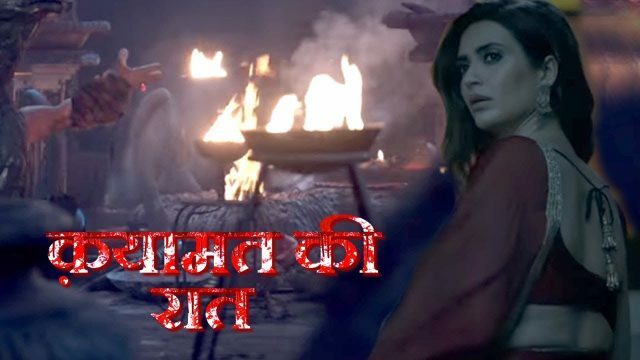 In the latest episode of Qayamat Ki Raat 24th November 2018, Raj kills Savitri. In the Tv serial of Qayamat Ki Raat, there is high volt drama is going on. For those viewers who like the drama, they did not miss today’s episode. Today’s written update of the Tv serial Qayamat Ki Raat begin with Raj opens his eyes. Prithvi said how did all this happen? He said that I did not know some thugs attacked me. I did not remember anything else now. Meenakshi asks Gauri what did you see? She recalls all the incidence. She said Raj went to hit the thugs. He has fainted when we found him. Prithvi said to let him rest here. Uma opened her locked and said that it is not there. That means the woman is back. The woman calls to Uma and told her did you remember my voice? And my face also? Did she ask so many questions like how are you? Old now? Remember who I am? Uma said that yes I remember are you Savitri?she is dazed after listening to this. Gauri looks at Raj and she is soo worried. Raj holds her hand. He says to Gauri that always with me. Don’t ever leave me, I can not leave without you. Raj said to Gauri that you are my life and without I can’t think to even alive in the world so never leave me. Gauri wonders if he recalls what happened. She said I am with you all the time. Savitri said yes I am back. This is not good for you. I am here to end the game that you played with me. You are Kalasur’s sister. No one in that family knows the reality. She said but I know the truth and I will expose you. Your secrete will be out. Uma says what do you want from me? Precap: Dharam said who did this with Raj. Gauri replies Tantrik. He is back and he is in Raj. He burned some profs that could help us just this is left. It is the photos of Savitri with a kid.